We did it 🏆 Last weekend was the first ever Global WordPress Translation Day and it happened just as planned and exceeded our expectation about the overall activity. It was a great first event of what I’m hoping we can turn into a regular series so we can get together more often, bring new people on board and improve our processes, documentation and, let’s face it… our contributing experience overall. Everything was organised in an open Google Spreadsheet that everyone had access to edit. The ultimate exercise in trust and initiative as everyone could jump on and add information/change/ask questions. We are all extremely grateful to Scott Basgaard who allowed us to basically clone the last WordSesh site and change the content, so http://wptranslationday.org is basically WordSesh with our colours and content. The Website allowed us to have a real marketing campaign and in less than 3 weeks we got more than 1300 people to sign up to take part of the event. For the live streaming sessions, we used CrowdCast, which worked beautifully and I would highly recommend if we ever decide to do webinars or any online training. We had live video translation training for 12 languages – Japanese (in that language, by the GTE team) and a general one for all locales in English that I did in the beginning of the day. There were 22 live sessions overall including development training and translation training, several videos from different WordCamps dedicated to i18n & L10n. Speak only one language? Peak at #WPTranslationDay hashtag or live stream anyway and appreciate how many outside the US use WordPress. I also want to thank Danielle who jumped on the schedule last minute to wake us up and chat about his great browser extension GlotDict that helps translators get a global Glossary. You can watch the session here. here. During the day, the hashtag got updates from 202 accounts, 500 posts were sent that generated 945,251 impressions. See all the pictures and all the buss on the official hashtag #WPTranslationDay. Here’s just a small selection of photos. How is your #WPTranslationday going? I like to thank several people who made this event possible. Scott Baasgard, for providing the WordSesh site infrastructure and all the WordSesh know-how for our live streaming sessions. Thank you, Scott, this couldn’t have happened without you. A big thank you to SiteGround, who donated the hosting and domain and provided solid support during the event. Chantal and Nao, who helped me so much with the site and the communication across teams providing tech support, copy for the internal blog posts and constantly had my back when I needed it. To each and every one of you who submitted a video for our great promo video and helped spread the word about the event after. To Yana, who edited the video in one night, Hacko and Rob, who fixed bugs and helped me make sense of the different screencast options. To all of you wonderful GTEs who committed your time to creating a presentation for the day, we’re paving the way to better documentation and more openness in the team, thank you. To all our other wonderful speakers, John, Nikolay, Claudio, Danielle, who did the technical sessions for theme and plugin developers. To everyone who jumped into the idea and organised a local or a remote event during the day – you were the backbone of this initiative and we couldn’t have done this without you. You are a true inspiration and I’m sure we’ll get even more events next time thanks to your work. And to Sonja, who stayed up with me for 25 hours providing support, tea, laughs, taking over when needed and who also spend the whole 25 hours translating to German in between taking care of me. I love how this event brought us all together and I hope you all agree that we should do it again and soon. How did the day go for you? Share your impressions. Would you like to do it again? What should we do differently next time? Let’s make it even better. That’s amazing Petya! Congrats to everybody! We rock and was a pleasure! The GlotDict 1.0.6 release is available since today with many improvements! Really enjoyed it, still translating today 🙂 It was really great experience. Thanks to all the people involved 😉 Let’s do it again! Oh, the beauty and the momentum of our community! We have been pushing the cause of translating WordPress to Indian languages for a couple of years now. However, nothing gave this cause such a boost and got us such fantastic results like this event. Thanks for this! I hope we’re able to use this push to gather more momentum and get WordPress to more Indians in their own language so that they realise the true power of Internet – having a voice that is heard! Also, India has about 21 languages in an official schedule: https://en.wikipedia.org/wiki/Languages_of_India#Scheduled_languages of which four are shared between neighbouring countries (Urdu: Pakistan, Bengali: Bangladesh, Tamil:Sri Lanka & Punjabi: Pakistan, uses a different script). According to the [last released census figures](https://en.wikipedia.org/wiki/Languages_of_India#Census_of_India_figures), there are 29 languages with more than 1 million speakers, 60 have more than 100,000. That’s an impressive list of almost a 100 languages. Hopefully, the next event will help improve the status for at least the scheduled languages. 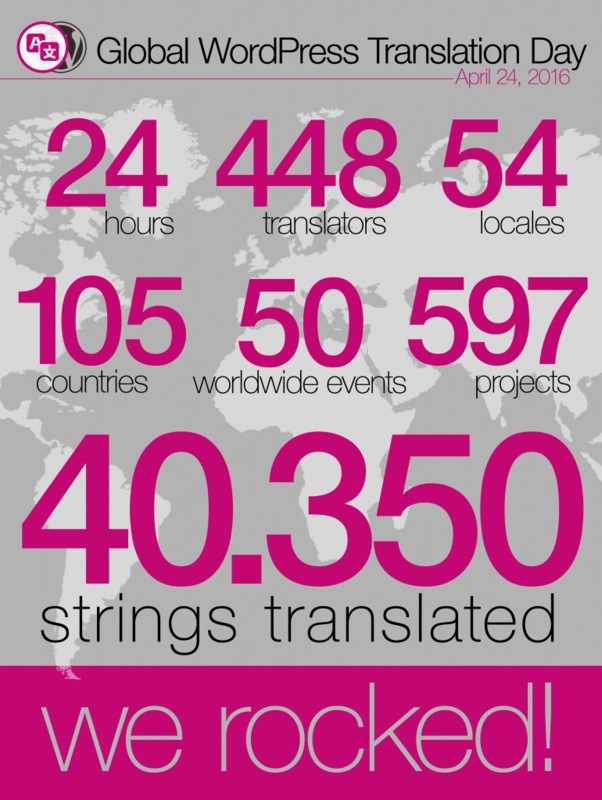 Maybe, we could work on a Regional WordPress Translation Day! Adding more of the languages of India would be great. I realise how many there are and how they can impact the reach of WordPress. So yes, hopefully, the next event will raise even more awareness. @petya Thank you for featuring our team photo in slides. That was wonderful week. Loved translating WordPress In Marathi.